We’re just days away from two major holidays, Passover and Easter. I grew up celebrating Passover and Mark’s family celebrates Easter and together we practice our family’s traditions and have created some new ones that are now all our own. For us, the root of our traditions centers on our love of food. Food brings people together, it sparks conversation, and it inspires people to learn more, share more, and love more. This year for Passover, we’ll be doing a quiet Seder at home and we’ll be hosting a spring brunch on Sunday that will feature elements of both traditions. As I do my menu planning, I continue to debate (with myself) what to make. The trouble with tradition, or perhaps the reason for tradition, is that so many of the “traditional” foods are no longer part of our regular diet – dishes like low and slow cooked brisket, oversized matzo ball soup, kugels, honey cakes, are once, twice, maybe three times a year specialties. But, that is what makes them special – heavy too – but always special. Does a departure from the traditional Ashkenazi (Eastern European) menu in favor of a Latin/Asian/Sephardic (North African) inspired meal mean I am losing my traditions? What would Tevye say? Or is it a fun and inspired way to add new culinary skills to a millienia old meal? These oil laden dishes are really most worth savoring because of the stories of the parents, grandparents and great grandparents that made the same dishes in their own kitchens once upon a time. In the end I think I will continue to slowly and very subtly make adjustments to our menu, but one thing is for sure, we’ll eat lots and lots of matzo. For Matzo Toffee – or Matzo Crack, depends on who you ask! Preheat the oven to 375 degrees Fahrenheit, and line a baking sheet with aluminum foil and/or parchment paper. In a large sauce pan, melt the butter and brown sugar over medium heat, stirring constantly. Once the mixture reaches a boil, continue to cook for an additional three minutes, still stirring, until thickened and just starting to pull away from the sides of the pan. Remove from heat and pour over the matzo, spreading an even layer with a heat-proof spatula. Be super careful, this is a great way to burn a finger or a hand. Put the pan in the oven, then immediately turn the heat down to 350 degrees. Bake for 15 minutes, watching to make sure it doesn’t burn. If it looks like it is starting to burn, turn heat down to 325. After 15 minutes, remove from the oven and immediately sprinkle the chocolate over the pan. Let sit for five minutes, then spread the now-melted chocolate evenly with a spatula. You can leave it just as is, enjoying the simplicity. Or add your favorite toppings while the chocolate is still melted. I like to add dried unsweetened fruit or blanched almonds or pistachios, steer clear of the peanuts, they are not kosher for Passover. 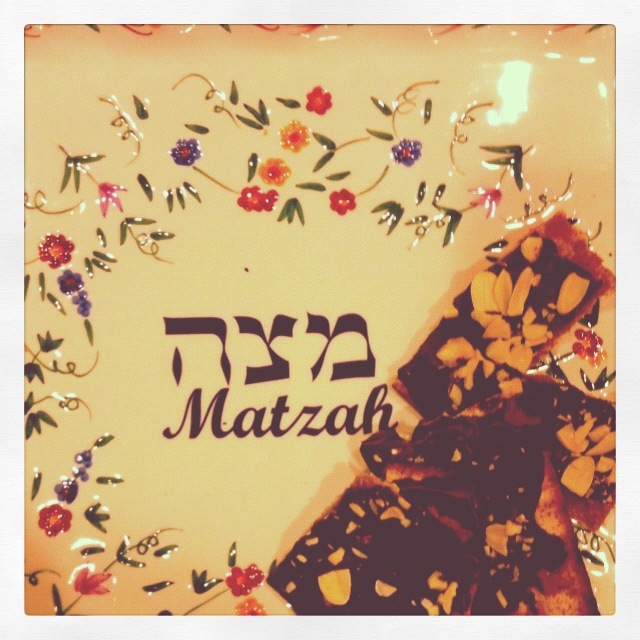 This entry was posted in Dessert, Easy Recipe, Her Kitchen, Jewish Holidays, Passover and tagged chocolate matzo, matzah crack, matzah desserts, matzah toffee, matzo desserts, matzo toffee, Passover, passover desserts. Bookmark the permalink.